We got a call today from Screaming Flea Productions, a company out of Seattle that's looking for a carpenter for the A&E show "Sell This House." If you don't look like Brad Pitt, that's great. They want a regular, down-to-earth looking carpenter that's good at what they do. They're looking to cast someone in December and then fly them to Texas to shot a test episode in January. Here are the details they sent along. We? ?re looking for a master craftsman to mix it up with our designer. Somebody confident, good at his job, and with an attitude. Very outspoken. Somebody who is good with people ?C he will be talking our homeowners through the projects. We? ?re shooting the pilot in mid-January and will need to have it cast by the end of the December. Any of your guys that are interested can contact me at the info below. FYI ?C I also contacted the Union in Chicago, so no pressure New England! Congratulations Brian. You are a tribute to Brotherhood of carpenters, your family and friends as well as your alma mater Northeast Metro Tech. I remember you as a hard working, dedicated student who would not anything stand in your way to becoming the outstanding person yoou are today. I fondly recall you rallying your classmates and informing them of the benefits as a Union Carpenter. Now can observe as you continue to grow and mature as a member of Carpenters Local 218. I'm not surprised. I worked for Mayo at an out-of-state location in 2008 and they were all about quick fixes, patch jobs, and little follow-through. They're the reason I don't trust corporate property management companies. Congratulations are due to Brother Brian Connearny, who was selected by instructors at the Boston Labor Guild as the valedictorian for the Fall 2010 class. Brian's a member of Carpenters Local 218 and the son and grandson of union carpenters from Local 67. Connearney spoke at the graduation ceremony this week about the service his father and grandfather gave to the United Brotherhood and explained the significance of elements of the UBC crest. The graduating class included six other union carpenters who participated in Guild programs. The Boston Labor Guild has been offering classes and services to foster greater communication and cooperation between labor and management since the 1940s. Local 275 Business Agent Kevin Kelley is currently the President of the Labor Guild. The event will also feature give-aways and raffled prizes, including a flat screen television. To register for the event, contact Blue Cross-Blue Shield at 800.262.2583. Join us this week as nationally and internationally recognized industry leaders team up with the Northeast? 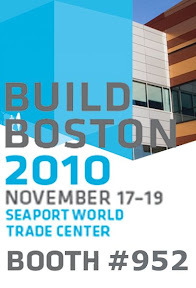 ?s best to share their expertise in over 150 workshops, sessions, symposiums and tours at the 26th annual Build Boston, November 17-19, 2010. The Carpenters Union is exhibiting at this year? ?s event in booth number 952. Build Boston is the Northeast? ?s premier architecture and building event. Representatives from the Carpenters will be on hand at the booth to speak with architects, engineers, contractors, interior designers, and other industry professionals participating in the three day event. Build Boston is a regional convention put on by the Boston Society of Architects. The event features nationally recognized industry leaders and is New England? ?s largest annual convention and tradeshow for the design and construction industry. For more information visit www.BuildBoston.com. Don? ?t forget to stop by and visit the Carpenters Union at booth #952. The story includes the tale of drywall carpenters employed Jared Stevens and Elite Drywall to perform work on a new Wicked Pizza location at the Legacy Place Mall in Dedham. NERCC Organizers confronted Stevens about the fact that his employees were owed $15,000 in wages for work they had performed at Wicked Pizza and another job in New Hampshire. The workers eventually went on strike, a story that was the focus of this NERCC video last month. In the FOX piece, Jessica Vaughan with the Center for Immigration Studies said government efforts to crack down on employers hiring and exploiting illegal immigrants has not been enough of a deterrent so far.
? ?Essentially what happens is these workers pretend to be legal and the employers pretend to believe them. And that's how everybody is able to keep the system going. ? ?It is easy for them to get away with it because there are no penalties. There's no deterrents for them. In most cases, what they're facing is a slap on the wrist or a warning," she said. Bruce Foucart, ICE Special Agent in Charge of Homeland Security Investigations in New England, told Beaudet that focusing on employers rather than individual workers would have a greater impact, but claimed budget issues and the newness of the enforcement efforts has limited their success. He admits the problem exists and the bad guys are the ones making out.
? ?It exists out there and the bottom line with that is the employers are benefiting. They're benefiting if they have an illegal workforce," Foucart said. "Employers are getting away with it obviously and given limited resources we're doing the best we can." After years of trying to tackle the problem by targeting immigrant workers, several years ago the New England Regional Council of Carpenters changed their focus in a way that is now being mirrored by enforcement agencies. Since the union began helping immigrant workers who are not paid properly, they are more likely to blow the whistle on employers who win work over honest union contractors by cheating. The union has also found it more beneficial to bring public shame to contractors and those who employ them, including owners who go out of their way to claim they don't know what's involved in lowball bids. Unlike immigrant workers and some subcontractors, they can't as easily disappear from the jobsites, or the communities in which they do business. Paul Greeley, the Director of the Carpenters Assistance Program (CAP) is being honored tonight by the South Boston Collaborative Center with the "Beacon of Hope" award. The South Boston Collaborative Center offers treatment and prevention support for those struggling with substance abuse. A native of South Boston, Greeley has been running the CAPs program since 2002 and has a history of involvement in South Boston prevention programs. A member of Carpenters Local 33 since 1983, Greeley is a licensed Alcohol and Drug Counselor and a member of the Labor Assistance professionals of Massachusetts. He volunteered throughout the 1990s as the director of a South Boston Courthouse-based program that offered alcohol and drug counseling. 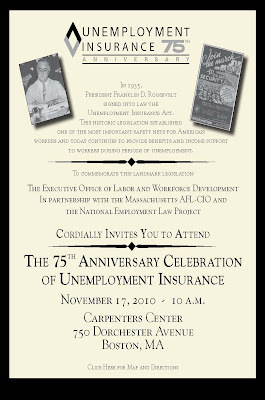 Seventy-five years ago, Franklin Delano Roosevelt signed into law the Unemployment Insurance Act. As all-too-many carpenters know these days, unemployment insurance has become one of the most important social safety nets in our country. It provides necessary support to workers who have lost their jobs through no fault of their own. Protecting decent unemployment benefits and fighting for extensions of benefits when the economy is bad for longer periods of time has been a regular battle fought by unions. 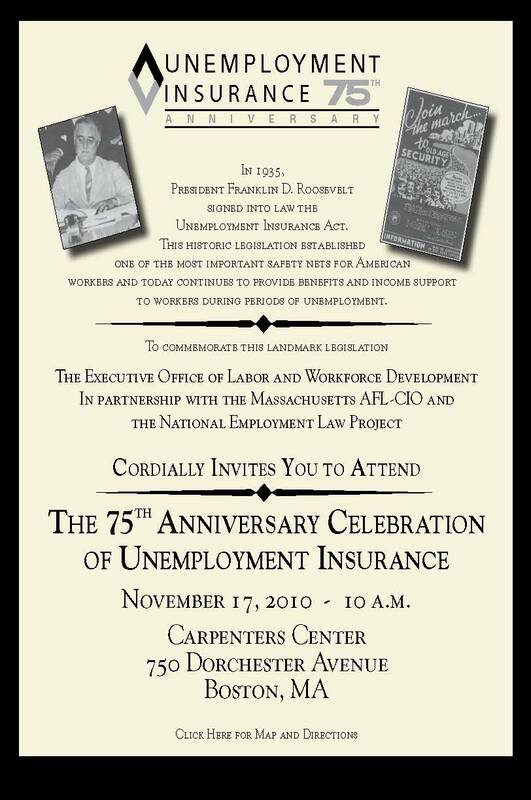 Appropriately, then, the Massachusetts Executive Office of Labor and Workforce Development will be holding a celebration of the 75th anniversary at the Carpenters Center on November 17. 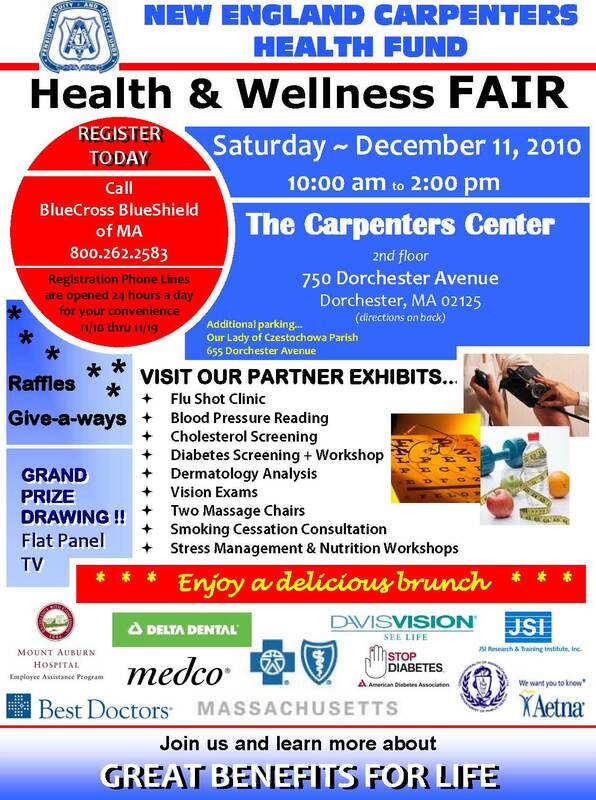 The event, co-sponsored by the AFL-CIO of Massachusetts and the National Employment Law project, will take place at 10am. Ballot issues in Bridgeport led extended voting hours, confusion and uncertain results in a couple of close races. By Wednesday morning, there still hadn't been a winner called in the Governor's race between NERCC-endorsed Dan Malloy and Tom Foley. Though Foley held a lead, it was narrow, only 10,000 votes separated the two after more than a million ballots had be cast. Ten percent of precincts had yet to deliver results. Fourth district incumbent Representative Jim Himes also had to deal with the anxiety of Bridgeport ballot problems and a very close race. But the carpenter's choice was being declared the victor in his fight for re-election. Chris Murphy, the Democratic incumbent in the 5th District scored a relative comfortable win over Sam Caligiuri winning 54% of the vote to the Republican's 46%. After Scott Brown's surprise win earlier in the year, Republicans had their eyes on more upsets in Massachusetts. Energized by national money and national momentum, they targeted both congressional and constitutional offices in the state. They lost every one of them. The big news was Deval Patrick's win over Charlie Baker for Governor. Patrick was a solid ally of union carpenter issues in his first four-year term. His re-election ensures important progress on issues like misclassification in the construction industry won't be wiped away. Carpenters were heavily involved in six congressional races, all of which ended up being wins with more convincing margins that some expected. Barney Frank, John Tierney and Nikki Tsongas won re-election by double digit margins while Bill Keating held on to the 10th Congressional seat for Democrats by beating Jeff Perry in a race that national GOP operatives thought very winnable. Keating will take over for the retiring Bill Delahunt. At the state level, all constitutional offices stayed in Democratic hands, though some will have new faces. Attorney General Martha Coakely rebounded from her stinging loss to Brown by soundly winning re-election. Steve Grossman and Suzanne Bump won larger than expected victories for Treasurer and Auditor, respectively. Of the three ballot questions considered by Massachusetts voters, the union had endorsed a position on only one: a no vote on Question 3. The question, which would have made a significant cut to the state income tax that would've had a devastating impact on local aid, was soundly defeated. Two of the three carpenter targeted races in Maine resulted in victories on election day. Both incumbent Representatives won by comfortable margins. District 1 Representative Chellie Pingree took 57% of the vote in her contest against Dean Scontras. In the 2nd District, Mike Michaud was also a big winner, besting Republican Jason Levesque by 12 percentage points. The race for Governor didn't go quite so well as Libby Mitchell lost a three-way race. Republican Paul LePage and Independent Eliot Cutler were locked in a tight race that hadn't yet been called by Wednesday morning, but would see one of them elected likely with less than 40% of the vote. The toughest night for Democrats in New England was undoubtedly in New Hampshire, where Republicans swept to massive victories in the State House with the exception being the corner office. Governor John Lynch, endorsed by union carpenters, won a fourth two-year term, unprecedented since colonial times. The New Hampshire delegation going to Washington will have a significantly new look. Republican Kelly Ayotte defeated Congressman Paul Hodes in the race to replace Republican Judd Gregg. The seat Hodes gave up to run for Senate was also lost to Republicans as Charlie Bass won a return ticket to Washington by defeating Ann Kuster. Bass had served six terms as a Congressman before being defeated by Hodes in 2006. Carol Shea-Porter, surprise winner in the 2006 elections, also went down to defeat at the hands of Republican Frank Guinta. Carpenters in Rhode Island had targeted two races, one on the state level and one on the federal level. Carpenters endorsed former Republican Senator turned Independent Gubernatorial candidate Lincoln Chaffee, who was victorious. Chaffee defeated Republican John Robitaille and Democrat Frank Caprio. The son of long-time former Senator John Chaffee, Lincoln Chaffee left the GOP in 2007 after being defeated in a bid for re-election to the Senate by Sheldon Whitehouse. Taking over Patrick Kennedy's seat in Congress will be David Cicilline, who defeated Republican John Loughlin. Cicilline was elected Mayor of Providence in 2003. The two targeted races in Vermont went in dramatically different directions, but in the end were both good news for union carpenters. Democrat Peter Shumlin had to wait until 9 a.m. Wednesday before getting a call from Republican Brian Dube conceding the race for Governor of Vermont. The closely fought race came down to just a few thousand votes. Shumlin will take over for Jim Douglas who did not run for re-election to a fifth two-year term. Senator Pat Leahy cruised to re-election over Republican Len Britton. His 33-point win sends him back to Washington for a seventh term. Leahy will be the second most senior member of the Senate in its next session. Yesterday's election results indicated, once again, that voters in New England are independent thinkers and do not necessarily follow national trends. While Carpenter-endorsed candidates did not win every race in every state, they were overwhelmingly successful. Our efforts were critical in holding back the national Republican anti-union tide. Once again, the members of the New England Regional Council of Carpenters demonstrated their readiness to work hard on behalf of those politicians who have continued to defend workers rights in the most difficult economic and political environment of our lifetimes. Our members made signs, phone banked, attended rallies, knocked on doors and did all the crucial things that make up the ingredients of a winning campaign. I am as proud of our organization -- its members and its staff -- as I've ever been. Thank you all for your hard work. It paid off. Election Day may have been Nov. 2, but protesters from the carpenter and steel workers unions wanted to get the vote a day earlier with their own election. 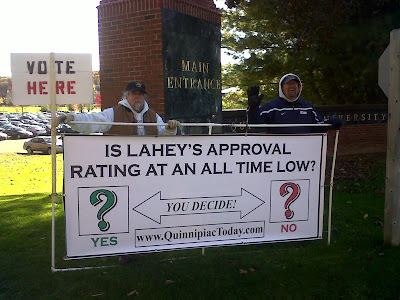 "We wanted to play off Election Day and find out Lahey's approval rating on campus," said Jeff Wolcheski, a business representative and organizer with the New England Regional Council of Carpenters. Members of the Quinnipiac and Hamden communities driving up Mount Carmel Ave were met with the familiar sight of the protesters handing out flyers, but this time participants were asked to stop and cast their vote. In response to the question, "Do you approve of the way President Lahey handles construction projects on your campus?" voters could choose to mark either "approve" or "disapprove". Responses were mainly verbal though, as the cool temperature kept participants from getting out of their cars to fill out a ballot, according to Wolcheski. "Many of the people we've spoken to have said they disapprove," Wolcheski said. The protesters are still looking to sit down with the Quinnipiac administration to discuss responsible employer language in the contracts the school gives to contractors they hire for their projects. In September, Joe Rubertone, associate vice president for facilities administration, called Bruce Lydem, vice president and director of organizing for the Carpenters Local 24 union, to ask about the protests. According to Wolcheski, the phone call came after the school's Board of Trustees met at the university and saw the protesters. While Lydem and Rubertone corresponded back and forth, protesters scaled down their activities. But on Sept. 28, all communication ceased, according to a press release sent out by William Jordan, a business representative and organizer for the New England Regional Council of Carpenters. After this, protesters decided to ramp up their efforts again. "We're asking for a level playing field," Wolcheski said. "[The Quinnipiac community] deserves quality work on campus." The Connecticut Department of Labor has already issued stop work orders against two contractors working on campus projects because of the illegal misclassification of employees as independent contractors, according to the press release sent out by Jordan. "We have a solution to the misclassification," Wolcheski said. "We want to speak about responsible employers working on campus." Wolcheski has said their protests are not about hiring union workers over nonunion workers. "If Quinnipiac University was acting responsibly and hiring responsible contractors who abide by community standard wages, benefits, retirement packages and state and federal laws, we would not be out here right now," Jordan said in the press release. Wolcheski compared Quinnipiac's hiring practices to Yale University. "Yale doesn't allow third and fourth tiered subcontractors," Wolcheski said. "Quinnipiac wants to be in the same league [as Yale] but won't act with the same responsibility." The university has no comment on the matter according to a statement by John Morgan, associate vice president for public relations. Wolcheski, the phone call came after the school's Board of Trustees met at the university and saw the protesters. Read the article on the Quad News website here. Polls will open in about 15 hours. Have you done all that you can to make sure you? ?re celebrating results tomorrow night rather than worrying about what the next few years will bring? As a union, the Carpenters have a tremendous reputation as campaigners. We build signs, we do standouts, we make phone calls, we rally for our candidates. Now we need to put the final piece of the puzzle in place. We need to Get Out The Vote. GOTV is the most crucial part in any race. Raising the profile of a candidate is one important step. Convincing voters that your candidate is the best option in the field is a second, vital part of any campaign. But the only numbers that count in any election are vote totals. We are supporting a full slate of candidates in every state in New England. And with few ? ?sure things?? out there this year, ever candidate and every campaign is looking for help. We have the experience and the bodies. Now is the time to turn our favorite candidates into our favorite elected officials. Now is the time to ensure that when we have an issue that? ?s important to us, our phone calls get returned and action gets taken on behalf of our members. Not ever campaign activity is fun. At this point of the campaign, many voters are tired of phone calls and literature brought to their front door. But that doesn? ?t mean those activities don? ?t play a vital role in a successful GOTV effort. I? ?m asking all staff and all members to get involved in any way necessary to help the candidates we? ?re backing. The negative national predictions are just that, predictions. Pundits don? ?t make election results, hard working campaigns and voters do. The future is in our hands. Let? ?s get to work.